This week, one of the communities we serve experienced the type of tragedy you hope never happens in your hometown or to your kids. The community of Freeman High School, just south of Spokane, Wash., was the site of a harrowing school shooting on Wednesday, leaving one student dead and three others injured. As a parent, I can’t begin to imagine how the students, their families and the local community must feel. My heart is heavy for them. On behalf of everyone at Providence St. Joseph Health, we send all our love, blessings and prayers to the people of Freeman High School. I am also incredibly proud of our caregivers at Providence Sacred Heart in Spokane for rapidly responding to the situation, creating a safe haven for the victims and their families, and sending chaplains to the school to support the healing process through spiritual care. This has not been an easy time for our team in Spokane, and I want to thank them for all they do. They are a rock-solid pillar in the community, always there for our neighbors even in the most unthinkable circumstances. Sadly, health care professionals are exposed to violence far too often. In fact, just last week, a shooting occurred on our hospital campus in Everett, Wash., also involving young people. At some point, it takes a toll. None of us are immune to trauma even if we’ve seen it bust through our emergency room doors too many times to count. Even more stressful is the reality that people who work in health care settings are sometimes the target of senseless violence themselves. The number of tragedies these days can feel relentless, whether its destruction at the hands of violent gunmen or wildfires and hurricanes. That’s why it’s more important than ever for all of us to be there for one another. 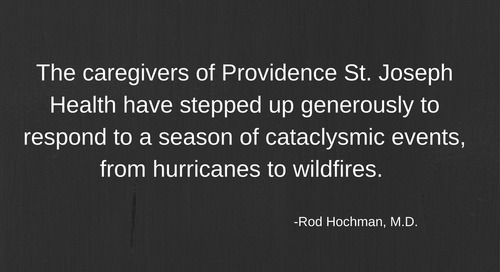 Caring and compassion are at the heart of who we are at Providence St. Joseph Health. I am inspired by the way our caregivers are coming together to love and support our communities and help each other find healing.